3.5 out of 5 based on 51 bloggers and 9 commenters. 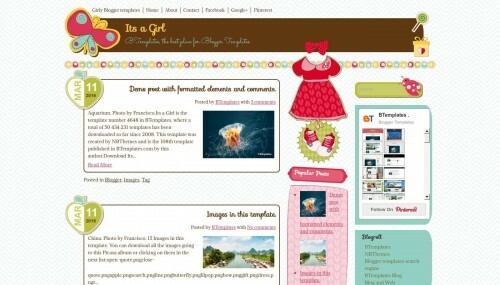 Its a Girl is a free blogger template adapted from WordPress with 3 columns, responsive design, right sidebar, fresh look, rounded corners, a background pattern, well designed threaded comments, cute design, girly looking and floral motifs. Excellent template for blogs about animals, business, crafts, to write a diary, education, family, fantasy, fashion, health and beauty, kids, love, nature or people. Muy linda, me gustaría solo poder quitarle la imagen de la ropa con zapatos y el dulce . Can I change the default baby dress and shoes?